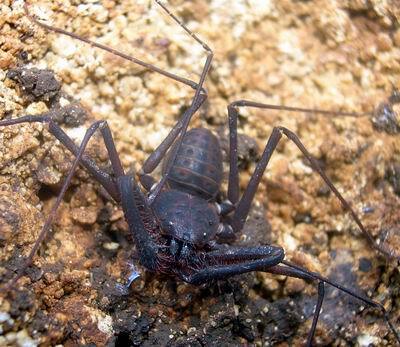 Amblypygi, or whip spider, are member of Arachnids group which are strongly flattened animals, with strong raptorial pedipalps, armed with large spines and very long front legs. The whip spider of south Pacific was firstly described by Koch in 1867 with specimens collected from Upolo, SAMOA namely Charinus australianus (described as Phrynus australianus). The second species was described from New Caledonia by Kraepelin in 1895 namely, Charinus neocaledonicus. The systematics knowledge of whip spider in south Pacific is provided by Weygoldt 2006 with detail discussion on Charinus australianus species group. Recently, there are four species and four sub species of Charinus in south Pacific, three of them are found in New Caledonia. The whip spider of Vanuatu was reported by Harvey 2003 with a record of Charinus australianus with no specific island. Whip spider in Santo Island is firstly studied during the expedition of Santo 2006. About four distinct species of Charinus are known so far which are 3 species found in caves and one species from epigean habitat. The species were suggested to be a member of Charinus australianus species group. A further study on genitalia especially on female genitalia is required to prove that the species are a member of C australianus species group. Based on the spination on pedipalpal distitarsus showed that the species is differed from Charinus australianus australianus which is the subspecies has two short spines on dorsal pedipalpal distitarsus. The specimens from Santo island are mostly has two long spines on dorsal pedipalpal distitarsus. The first species suggested come up from epigean habitat which are found under stone on the doline of Grotte Fapon and Natawa Doline. The size of this species is smaller compare to other species from caves. The coloration on the body is also distinct compare to specimens collected from caves. Several specimens collected from caves were showed at least two distinct species. The second species is found from Grotte Keffae which is quite large specimens compare to other specimens from caves. The Grotte Keffae is the longest underground cave system known so far in Santo island. A further taxonomics analysis are need to be done to show whether the species have been described or might be new to science. As preliminary observation, at least two new species are believed to be exist.